When Chris and Mary Denby purchased their duplex in February 2007, renovations were the last thing on their mind — four days after moving in, their second child was born. After getting settled and making a list of home improvement priorities, they decided a major kitchen overhaul was not on the top of their to-do list. The kitchen was original to the house and in need of serious updating, so they added new appliances and a dishwasher for the time-being. So here are a few before shots of their vintage kitchen. 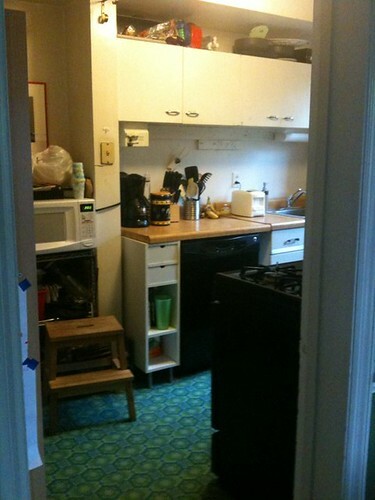 Note the minimal storage and the counter above the dishwasher held up with a makeshift cabinet. In the picture below, the refrigerator juts out and makes opening the backdoor difficult. And here is their kitchen after renovation. 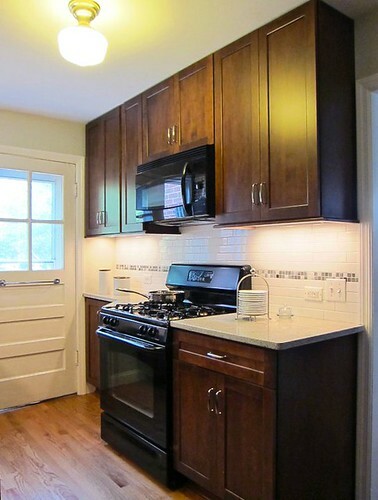 The kitchen was completely gutted to the studs and all new walls, counters, cabinets, and fixtures were installed. Check out that sleak and smooth granite countertop with an undermount sink! Below see how the refrigerator was moved to the side wall. The Denbys had to bump the wall out into the living room, but this meant more countertop space and a more open layout. New hardwood floors were also installed, continued from the dining and living room. The room is incredibly bright. 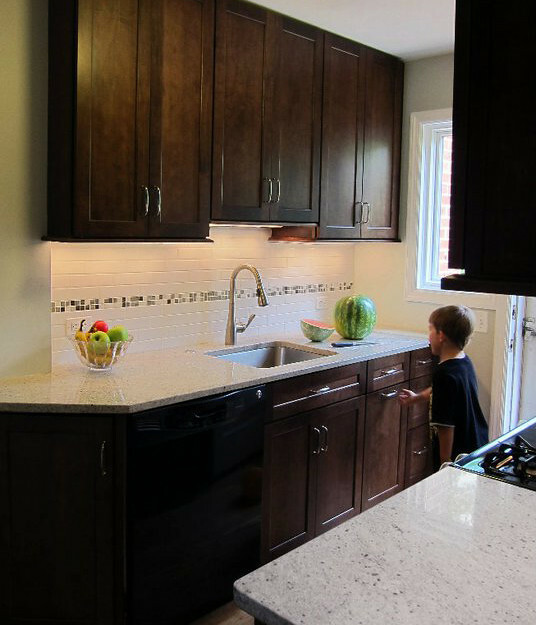 Dark brown cabinets and black appliances are contrasted with white granite countertops, white tiled backsplash and undermount lighting. This once dingy kitchen is now a shining star. Moving the refrigerator created a more accessible layout and enabled an extra countertop and cabinet to be installed next to the stove. Mary: We tripled the amount of counter space and we have lots of storage. Chris: We can finally get our wine glasses out of the attic because there is a place to put them in the kitchen. Mary: I would probably open up the wall between the kitchen and dining room. It would be nice to have a more open floor plan, but with 3 mechanical ducts in the wall, it would have been more difficult, time-consuming, and expensive. Plus we would have lost a lot of upper cabinet space. Chris: Nothing really, but one minor thing is I would increase the distance between the counter and the upper cabinets — it’s hard to use appliances like coffee makers. Chris: Overall the project went rather smoothly. But the biggest frustration would be not having a kitchen for 3 weeks and the dust that spread throughout the house. Mary: The back splash was expensive, but my mom installed it so we saved on the labor cost. Chris: Be ready for the unexpected. Projects hardly ever go as planned. We were thrown for a loop with the amount of ducts that limited the project somewhat. Thank you Chris and Mary for sharing your fabulous new kitchen! If you have a question about this project for the homeowners, use the comment field below. Want to share your before and after story? Email diydelray[at]yahoo.com. I’d be really interested in the original kitchen dimensions. 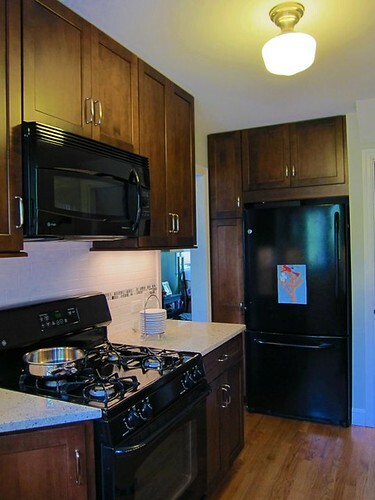 My kitchen is SO similar, but I can’t figure out how I would possibly get appliances and cabinets on both sides of the galley as they do here. Great feature! Thanks so much. Thanks for reading, Elizabeth. 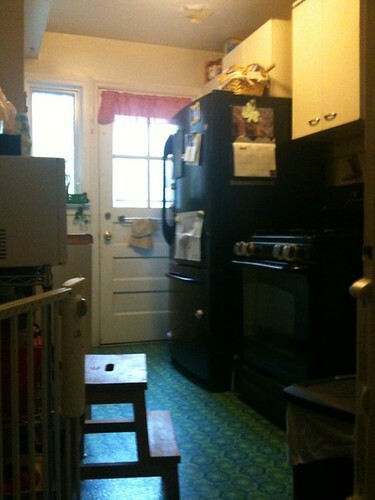 The original kitchen was about 7’x10.’ When they bumped the refrigerator into the living room, it became 7’x13.’ The extra 3 feet is only for the refrigerator and side cabinet. Their dining room (on the other side of the stove) is also very narrow and there’s only enough room for a dining table. We’ll be posting smaller kitchens in the next few weeks. I remodeled two of these duplexes on Custis Ave.
Ed – are you a contractor? We live in a Del Ray duplex, and are looking at dropping half the wall, but there are ducts behind it. You’ve got great insights about Home Improvement, DIY, renovate your home,, keep up the good work!